Scroll down to see 2013, 2012. 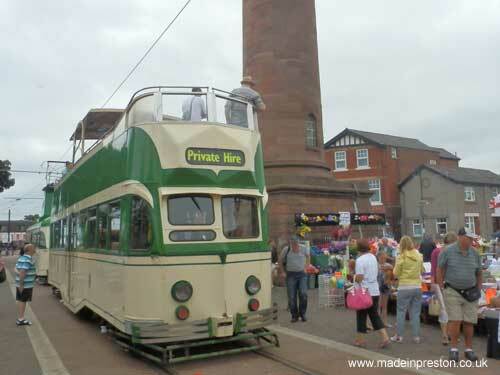 Blackpool Heritage Tram Tours put on a heritage tram service up to Fisherman's Walk while a static display was at Fleetwood Ferry. 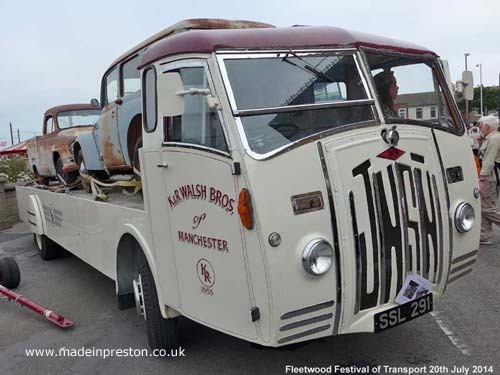 This restored Atkinsons tow truck had an old restored caravan with wooden panelled wall behind it. 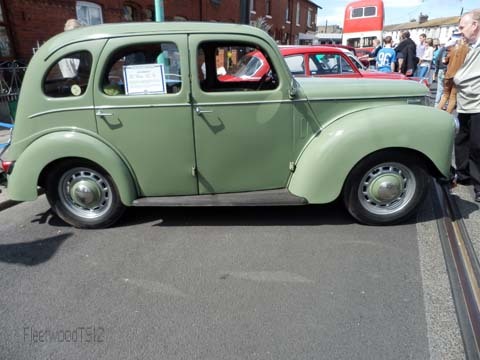 Restored by Bradleys of Formby. 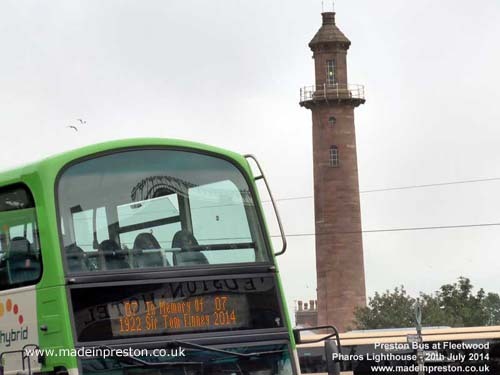 Preston Bus outside the North Euston Hotel with Tom Finney destination board and Pharos Lighthouse in the background. A good group was playing outside the hotel with a good sized audience. At Pharos Lighthouse a troup was playing and the Red Rose Barber Shop singers gave a rendition. Bumped into Paul Swarbrick of Blog Preston. 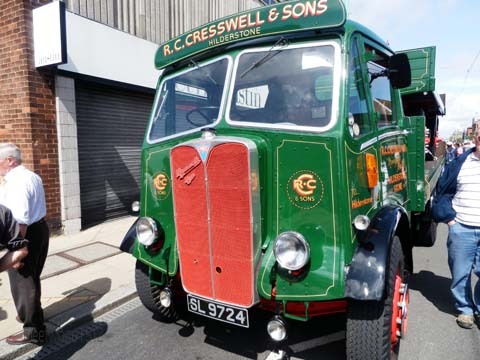 K&R Walsh restoration of Manchester brought an interesting Jenson truck with 2 vehicles awaiting restoratioin on the back. 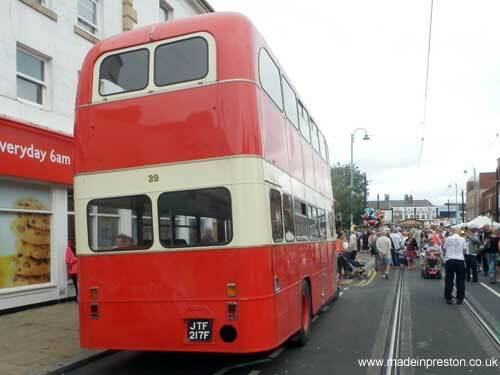 Plus Tram Sunday 2012, scroll down..
Fleetwood Tram Sunday 2013 was held on a warm day with quite a bit of cloud. 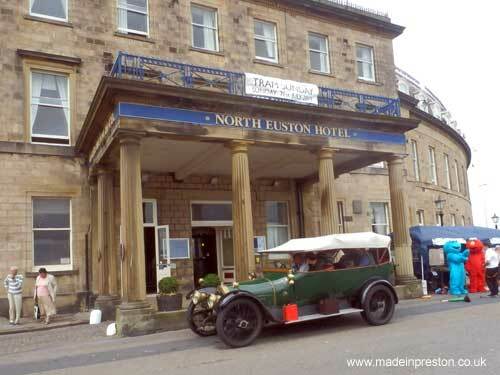 Highlights were the North Euston Hotel that looked good with an old and grand car in front. 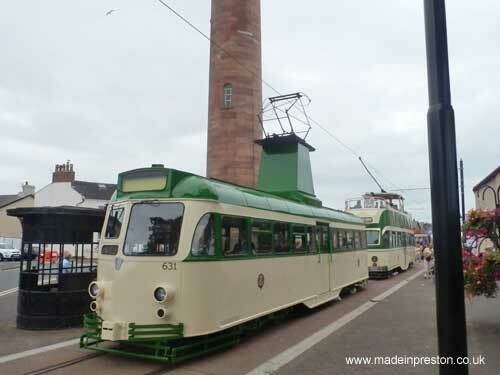 The trams on display at the lighthouse. Some good buses and trucks and a wide range of cars. Very crowded in the main street and every side street contained funfairs. 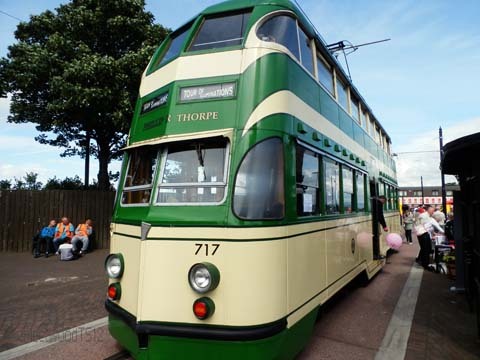 A Blackpool Heritage Tram Service was running to Thornton Gate near Cleveleys. 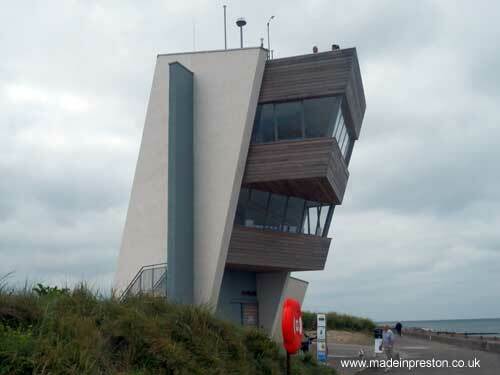 Also a walk to Rossall Point where the viewing tower is now open to look over Morecambe Bay, worth a visit..
Blackpool's new trams were running to the edge of the show. 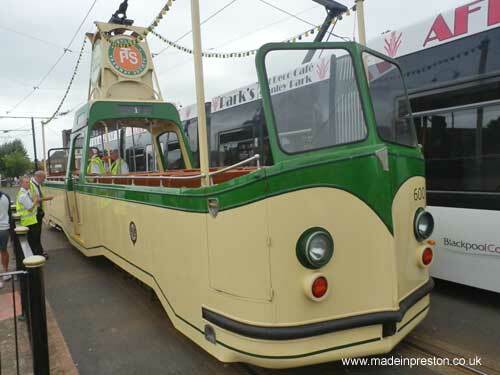 The Boat Tram was running to Cleveleys. 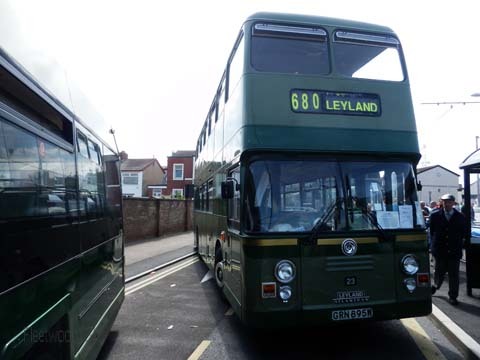 Decent Leyland bus from Salford. 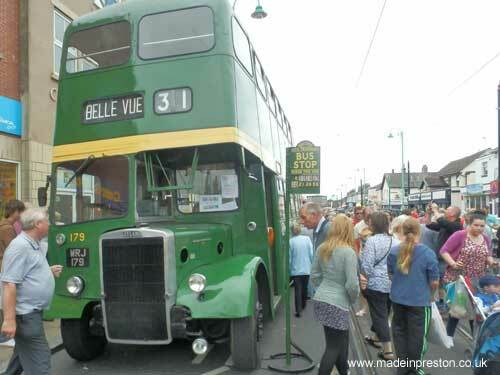 The open top double deck tram was on static display. This was made in Preston. This is a Brush made tram. 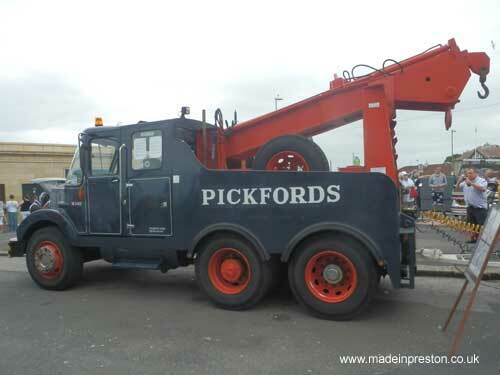 Pickfords Heavy Lifter. 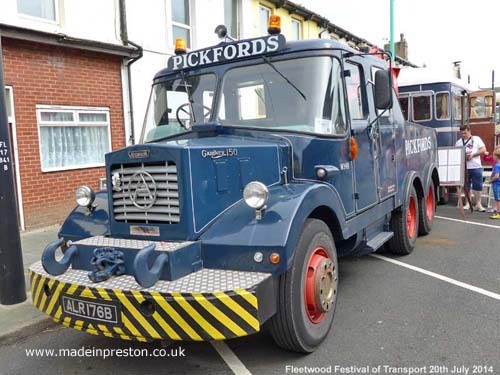 Made by Atkinson's Vehicles of Preston. 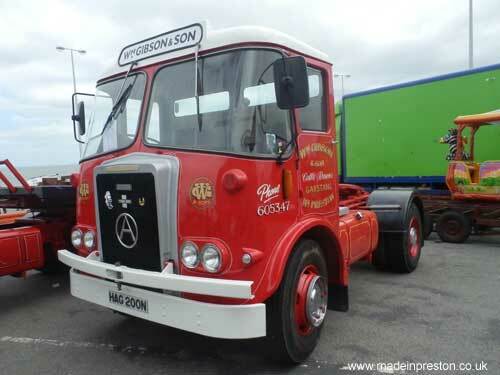 Atkinson's Vehicles, Preston - Walton Le Dale really. North Euston Hotel looking good. Some nice features in Fleetwood. Fleetwoods other old lighthouse. 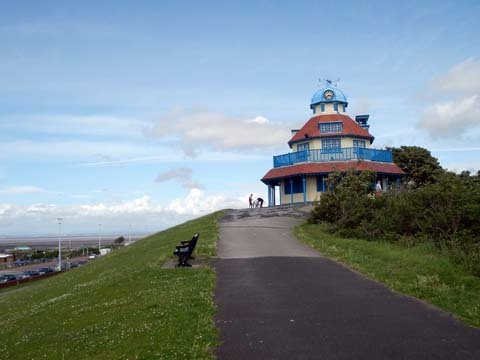 Fleetwood has 3 lighthouses. 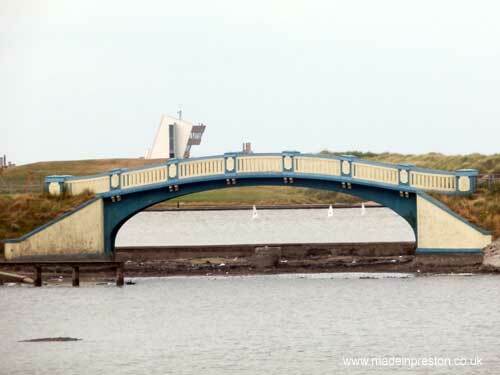 The Boating Lake with Rossall Point viewing tower in the distance. 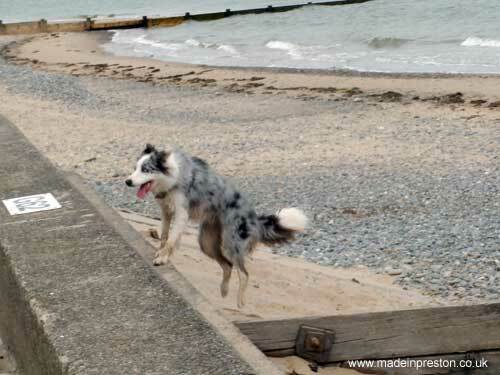 The Rossall guard dog jumping for joy. The Rossall guard dog deciding whether to let me in. 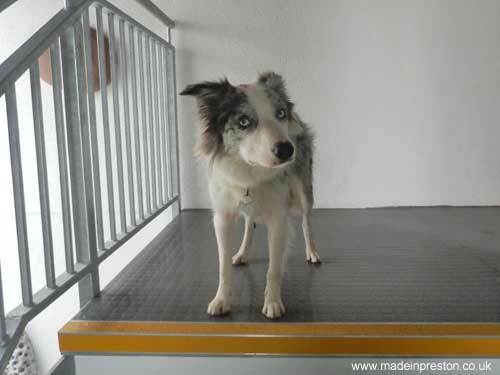 A silver dog with blue eyes. On a sunny day headed off to Fleetwood in the knowledge it would be packed, and it was. About a mile of vehicles, stalls, funfairs. A very large karaoke with the worst singer I've ever heard, so bad it was good, maybe that was the idea. 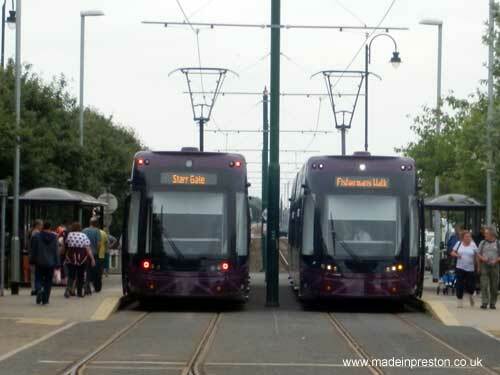 Strangely, as far I could tell there were only 2 trams so Tram Sunday is more a historic name it seems. Starting with a Preston theme. 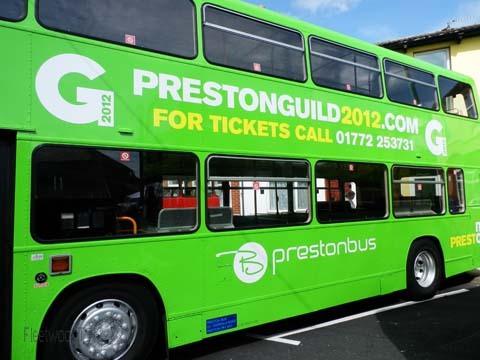 The two Preston Bus vehicles painted for the Preston Guild 2012 were there. Then a nice Leyland Tiger. Don't recall seeing one quite like this. 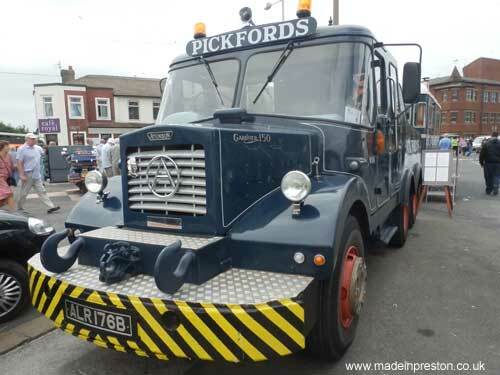 John Fishwick and Sons brought 4 buses from Leyland including a brand new one, not photographed. 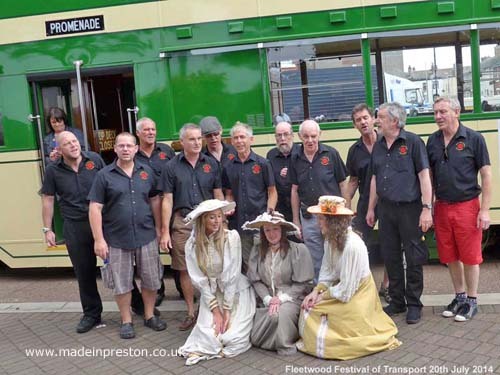 Familiar for over a 100 years to those on the Leyland to Preston bus route. 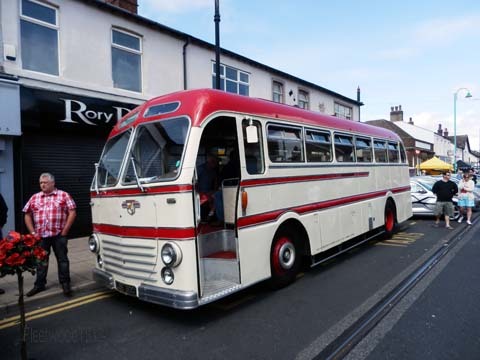 Smart Darwen Transport Leyland bus. 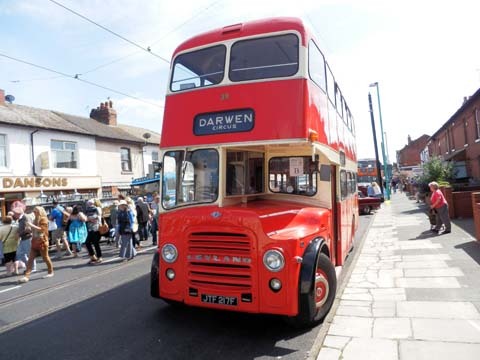 My uncle used to a foreman for Darwen Transport, a great guy, bus in great condition. 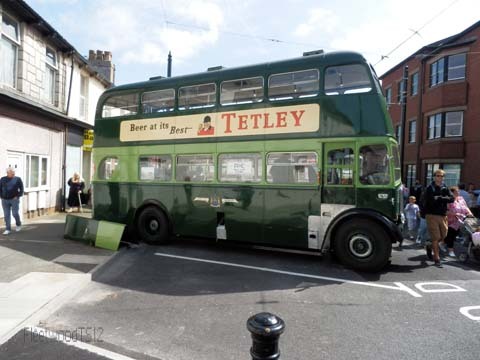 Leeds Transport Leyland Bus. Nice profile shape at the front. Good shape to the upstairs windows as well. Wheels as far forward as they can be. 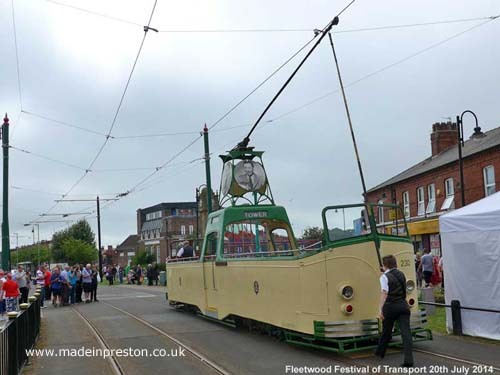 Blackpool Balloon Tram, was made in Preston in the 1930's. 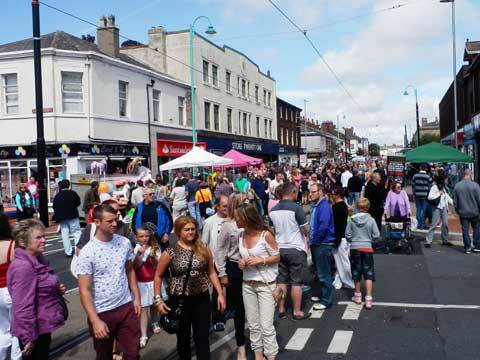 Crowds on Lord Street, Fleetwood. 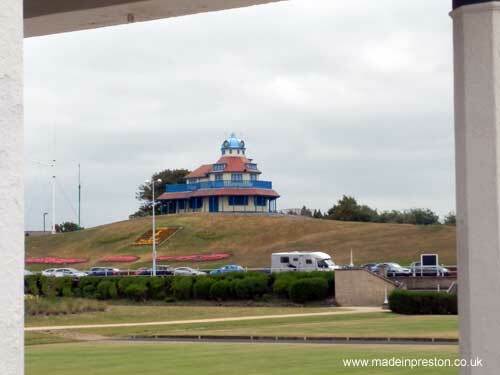 No collection of Fleetwood photos is complete without a photo of The Mount. It was a nice day with a view over Morecambe Bay to the Pennines and the Lake District. Ships coming out of Heysham. The wind farm on the horizon. Buildings like Lancaster University, Heysham Power Station, BAE Systems at Barrow visible. 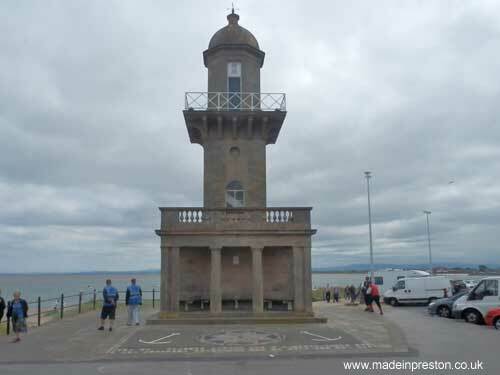 Fleetwood a town with 3 lighthouses and a decent museum showing off its trawling heritage.